Have you heard of ratatouille before? No, not the movie, the dish! This simple and classic recipe is an all-time favorite. Pure and wholesome ingredients and minimum effort. Magnifique! This recipe, originally from Nice, France, dates back to the 18th century. For years it has been a go-to for people all around the world. It’s a Mediterranean symbol dish of sorts. This version of ratatouille differs a bit from its original version, but the fundamentals are the same. 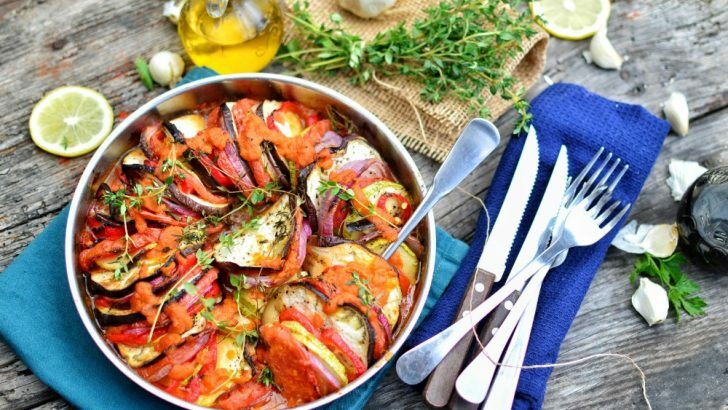 Eggplant, red peppers, zucchini, tomatoes, and onions are baked together in a deep dish with some essential herbs. 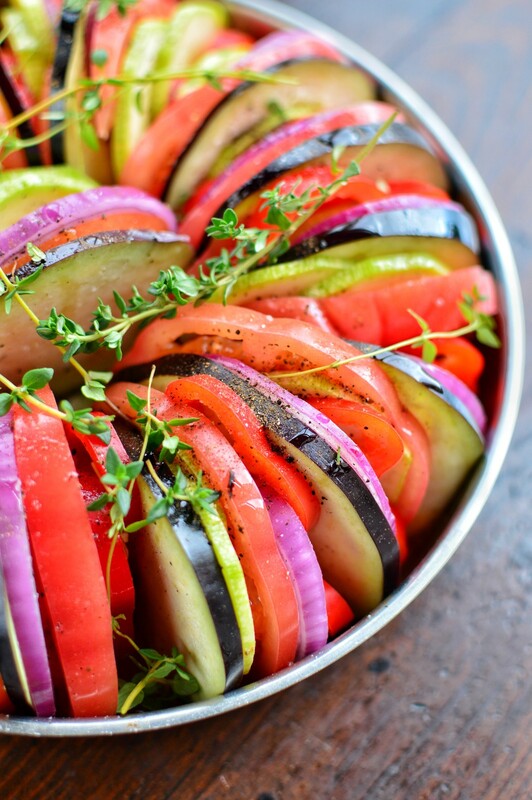 The tomatoes and onions lose their juices and give the veggies such a fantastic flavor. In this recipe, you’ll slice your veggies in even shapes and arrange them side by side in the baking dish. Then you’ll sauté the onion and garlic with some olive oil, add the tomato sauce, and pour it over the veggies in the deep dish pan. Pop it in the oven, and that’s it! No fancy cooking skills required. 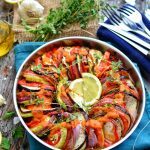 This fresh vegan ratatouille dish will take you to a sunny day in the Mediterranean and remind you of why we love these simple ingredients so much! In a saucepan, add olive oil and cook the finely chopped garlic with half a head of red onion (finely sliced). After 2 minutes, add the tomato passata (or tomato sauce) and season with salt and pepper. Let the sauce simmer for 3-4 minutes and add the little leaves from a sprig of fresh thyme. This will be your base for the ratatouille. Spread the sauce evenly on the bottom of a round casserole dish. Slice the vegetables very thin, about a fifth of an inch, or even thinner if desired. Arrange sliced vegetables in circles as shown in the photo and season with salt and pepper. Cook in the oven at 350 Fahrenheit for 30-40 minutes. Garnish with fresh lemon slices and a sprig of thyme, and enjoy! If you can’t be bothered carefully slicing and arranging your veggies you can simplify the process by cutting the veggies into small squares and sautéing them in the pan with spinach until everything is cooked and juicy. Then add the tomato sauce (you might want to add a bit more than this recipe calls for to make it saucier). You can serve it over some penne pasta! If you want to make it extra-heavenly, grate some vegan cheese on top. Another variation could be stir frying all the veggies and adding some cooked lentils to the mix. You can serve this version over some basmati rice with chopped parsley on top. So good! As you’ll see, this recipe is incredibly versatile. Get creative and give it a twist! A basic passata is an ideal choice for this recipe because it is what will ultimately bring all the flavors together. If you’re new to passata, it’s essentially uncooked pureed tomatoes. In this recipe, you’re welcome to use tomato sauce in its place. Note: if you use a richer passata with more seasoning, it might take over and diminish the flavors of the other ingredients. When it comes to this recipe, simple is best! That seems to be the motto of ratatouille and most Mediterranean food. Less is more. Even though they’re not exactly known for their superfood powers, tomatoes have many amazing properties! They have one very cool compound called lycopene. It’s is an antioxidant that protects the health of our hearts and contributes to lowering our chances of developing cancer. Another exciting feature of the lycopene found in tomatoes is the fact that it has been said to help reduce the chances of getting sunburned. Beware though, because eating those dull looking tomatoes won’t help much. The more vibrant and colorful the plant, the more lycopene it contains. Also, keep in mind that cooked tomatoes (like in tomato sauce) contain more lycopene than the ones you eat raw. 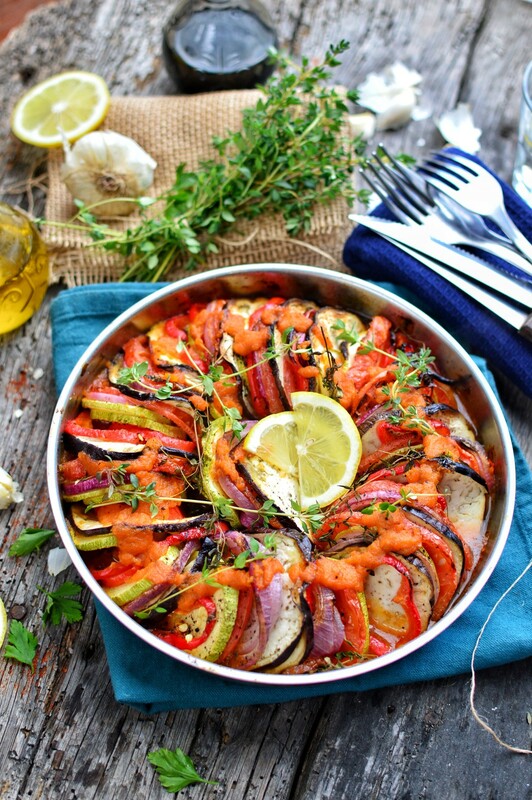 Can you see yourself sitting outside on a warm day eating this ratatouille dish with a nice glass of vegan wine? 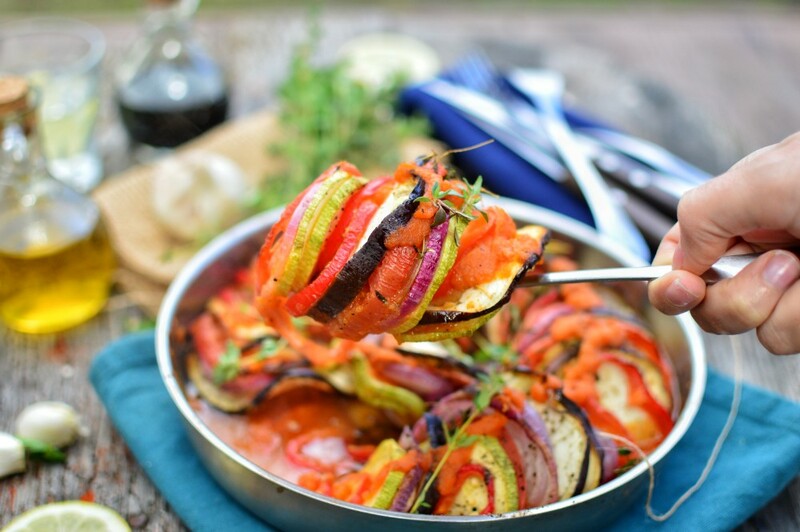 A perfect way to enjoy this vegan ratatouille is with some rustic toasted bread. So simple yet so perfect! Just slice the bread, drizzle some olive oil on top, sprinkle on some dried oregano, and pop it in the oven for 10 minutes. Once the bread is slightly crispy, you can put some of the ratatouille on top and enjoy! Wouldn’t this be perfect for enjoying with family over the holidays? No-fuss cooking means more time to spend with our loved ones while being able to have amazing long conversations, right? Not to mention delicious freshly made food! Simple and basic dishes give us that. Time and peace of mind. That doesn’t mean you can’t enjoy more time-consuming recipes when you have the time or motivation. Actually, these elaborate preparations also give us a chance to share the workload with those who we want to connect with. But balance is key! So…are you excited to try this simple recipe? I have no doubt that it will become a new favorite! Would you like to try more Mediterranean vegan recipes? Go ahead and check these out!